Sight casting is predominantly a fly game. A couple of times a season however a savvy spin caster shows up and wants to try it in the skinny. Pictured here is Bruce from Jersey. Bruce had never done any traditional push pole fishing before, but he took to it quick and caught about 10 bass in various locales on a range of live bait and artificial lures. Beautiful day with mid morning low tide and the best visibility we've had in a long spell. Nice work Bruce! Sorry about the dumpy photos today, I'm having exposure problems that I need to address ASAP. 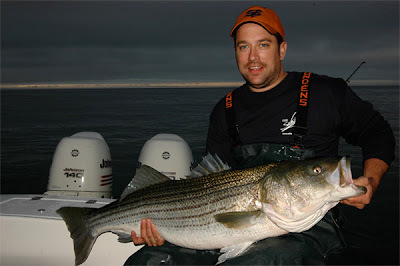 Drew from NY hoists a nice stripe on Friday afternoon.